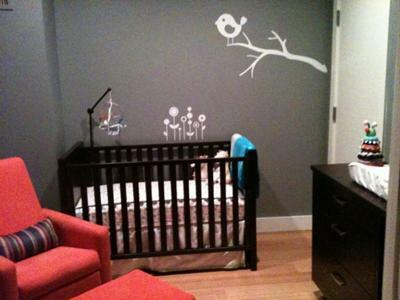 Small Modern Orange Gray, White and Black Nursery for Baby A Small Space with a Modern feel and Bright Colors! The purpose of this tour is to share our small modern nursery decorating ideas that will demonstrate how to design a room to give the impression of a much larger space. The back story is that we live in a very small condo in the city and we converted the only available spare room, the one we had used as a study, into a nursery for the baby. Since the living area of our home flows through French doors into the space, I wanted modern feel of the rest of the house to flow into the baby's room to make the nursery a fun and comfortable room where we could hang out and enjoy our child. Go here to see the latest in modern crib bedding sets in neutral or gender specific colors for your baby's room. 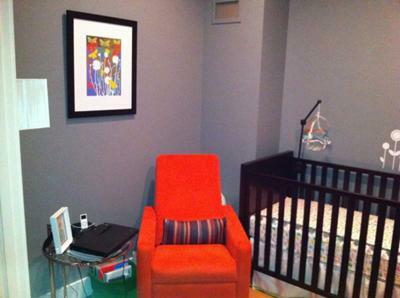 The key focal point of the room is a bright orange (and very comfortable) orange nursery glider by Monte. We chose a Pali crib and dresser as they were both known as much for their modern style as quality construction. The lumbar pillow on the glider is upholstered in fabric that has bright green, blue, pink and purple stripes on it and I tried to re-use every one of those colors as much as I could in other areas of the baby's nursery. I also used a lot of black and white in the room's decorations because I read that contrasts are easier for an infant to see. I found the flower and bird tree branch wall decals online and I made the 3D butterfly wall decorations out of scrap booking paper and wire. 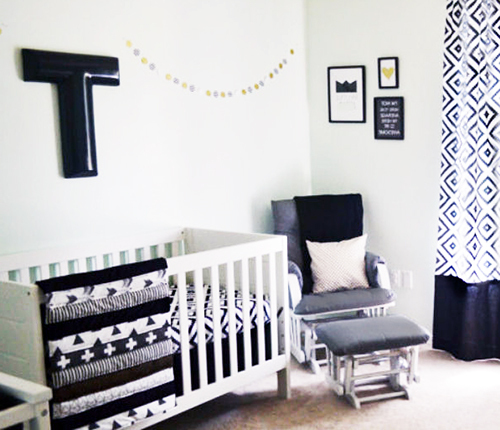 I incorporated as many bright colors into the neutral, gray baby nursery as I could using colorful baskets, toys and a beautiful framed print that is hung on the wall above the chair(also from Etsy). I fell in love with an owl print crib sheet from Pottery Barn Kids although the rest of the bedding was too "pastel" for my taste and we decided to go bumper-less due to all the controversy surrounding them recently. I can't wait to meet our little girl and see if she likes what I've done with her small modern nursery! The pops of bright color in the small space produced great results. Your design is a visual tutorial on how to successfully use color to make the most of however much square footage you have! Using the glider's striped pillow as your inspiration piece was a very smart move. 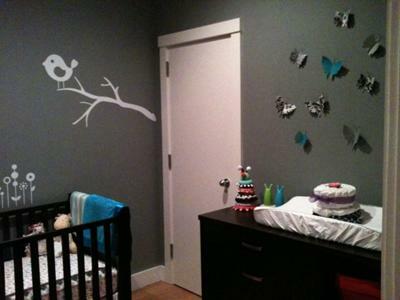 Thanks so much for allowing us to add your modern decorating tips with all of us here at Unique Baby Gear Ideas to our gallery of nursery pictures. I'm sure that our visitors will appreciate the many details of your small nursery's huge personality and see features that they will want to use in their own DIY decorating projects. The birds and the butterflies give the room a natural look and I like that but in my opinion, the most attractive feature is the orange glider. It looks awesome with that wall paint color. So sorry for the late response on the butterflies. I used scrapbooking paper that had designs on both sides (so baby looking up at them saw some pattern no matter the angle) and just cut some basic butterfly patterns I drew out of cardboard, traced on the paper and cut them out. Bent the butterflies at the middle and used black wire to make the antennas. Many people are working with small spaces so these tips are very helpful. How did you make the butterflies? The room looks really cute! !